Some flights bound for St. Louis Lambert Airport were diverted to other cities on Monday night, after a grand jury decided not to indict officer Darren Wilson in the death of Michael Brown. Ferguson is only about 5 miles East of the airport. Reports of guns fired into the air prompted the measure. "TEMPORARY FLIGHT RESTRICTIONS. WITHIN AN AREA DEFINED AS 3 NM RADIUS OF 384428N0901812W (ST LOUIS VORTAC STL129011.0) SFC-3000FT TO PROVIDE A SAFE ENVIRONMENT FOR LAW ENFORCEMENT ACTIVITIES. PURSUANT TO 14 CFR SECTION 91.137(A)(1) TEMPORARY FLIGHT RESTRICTIONS (TFR) ARE IN EFFECT. ONLY AIRCRAFT PERMITTED UNDER THE PROVISIONS OF 14 CFR 91.137(B) ARE ALLOWED TO OPERATE IN THIS 91.137(A)(1) TFR." A TFR is a type of NOTAM issued to pilots limiting flights in a specific area for a certain amount of time, due to hazardous or other special events. For example, a TFR is issued at airports into which Air Force One is landing. 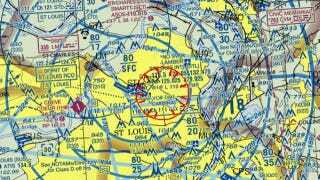 The FAA also issued a TFR over Ferguson for 12 days in August. At the time, police told reporters that the restriction was issued over concerns from guns being fired into the air, but the Associated Press acquired audio recordings which revealed the measure was put into place to keep the press from hovering over the area in helicopters. It's easy to assume that tonight's TFR was issued for the same reason.